Companies operating in the global chemical protective gloves market can benefit from opportunities arising from the increasing efforts to improve worker safety across the globe, identifies TMR. Some of the prominent companies operating in the global market for chemical protective gloves include Honeywell International Inc., Msa Safety Inc., Grainger, Inc, Kimberly-Clark, 3M Co, Ansell Limited, Avon Rubber Plc., E I Du Pont De Nemours and Co., Uvex Safety Group, and Bullard. Many of these market participants are actively focusing on developing products with superior characteristics and features. 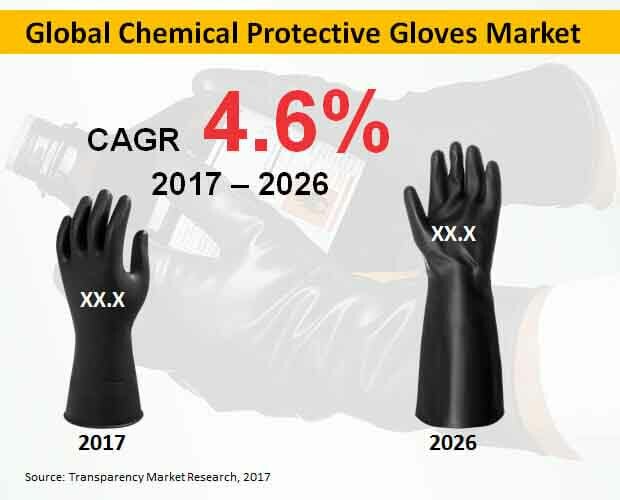 According to the recent report published by Transparency Market Research (TMR), the global chemical protective gloves market is projected to witness a steady CAGR of 4.6% between 2017 and 2026 to reach a valuation is excess of US$ 3,600 Mn. Increasing efforts to enhance worker safety standards is expected to drive the global sales of chemical protective gloves during the review period (2017-2026). Moreover, the increasing emphasis that is being placed on improving the working conditions in developing countries is expected to reflect favourably on the global market for chemical protective gloves in the near future. Governments in many of the third-world countries are trying to introduce new regulatory norms to develop the industrial working environment in the country. At the same time increasing awareness about workplace safety coupled with availability of better safety gears is influencing the global demand for chemical protective gloves. Countries such as China, Brazil and India are witnessing robust industrialization, which is further creating opportunities for worker safety gears and equipment, including chemical protective gloves. Over the recent years, these countries have seen tremendous economic growth owing development of various sectors in the country. Chemical protective gloves are used in various industries, including manufacturing, pharmaceutical, oil & gas, chemicals, mining and agriculture among others. Such gloves are becoming mandatory, particularly in high-risk working environment. These gloves can be extremely useful for protection from acids, chemicals and oils. In addition, implementing the appropriate safety rules can help employers tackle the issues of days-away-from-work due to injuries and illness, which often impact the manufacturing operations. Among regions, the market for chemical protective gloves in North America is expected to remain highly lucrative throughout the assessment period. In terms of revenue, North America is likely to retain its dominant position over 2026. From 2017 to 2026, the region’s market is set to exhibit a CAGR of 4%. This mainly due to presence of stringent worker safety regulations in the region. On the basis of product type, the nitrile segment is expected to hold the pole position in 2018 and beyond. In terms of revenue, this segment currently accounts for more than one-third market share and is likely to surpass a market valuation of US$ 1,800 Mn by the end of 2026, reflecting an above-average CAGR. Superior strength and resistance of nitrile gloves continue to drive their demand. Based on application, the manufacturing segment is expected to remain highly attractive during the assessment period. In 2017, the segment commanded for over 21% revenue share of the market and is projected to exhibit a CAGR of 3.8% between 2017 and 2026.